I'm trying to replicate the annualized Sharpe ratio of an buy-and-hold strategy for the Dow Jones Industrial Average index for a period consisting of multiple years. I got the daily DJIA (closing) price index (variable: "price") and the risk-free rate (given in a year percentage, variable: "rf"). 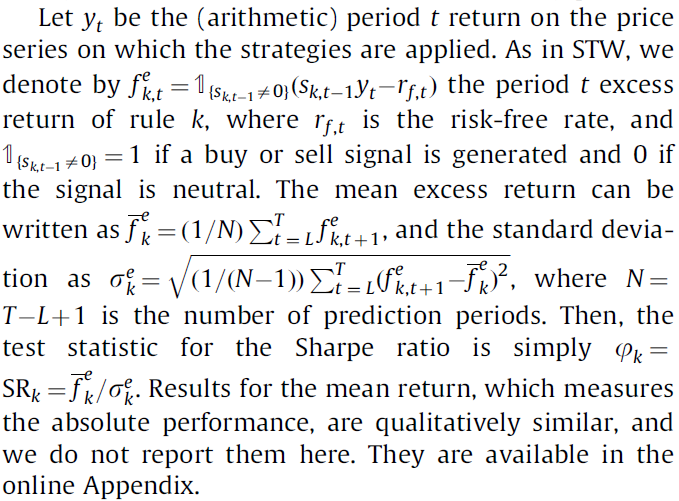 However the annualized Sharpe ratio doesn't correspond to the reported numbers. Am I missing a step/doing something wrong (with the logs?)? Not the answer you're looking for? Browse other questions tagged returns sharpe-ratio standard-deviation or ask your own question. Should Sharpe ratio be computed using log returns or relative returns?